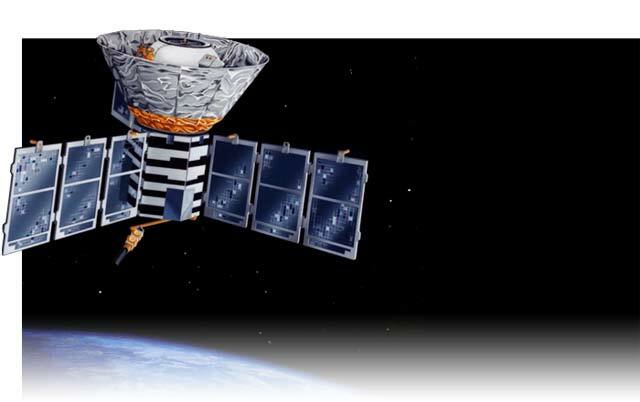 Students, educators and others interested in NASA's Cosmic Background Explorer (COBE) mission or in cosmology can find background information here. Access to the COBE data, documentation, and technical information is available from the COBE Data Products Page. How would the Earth appear if you were aboard the COBE satellite right now? Thanks to the Fourmilab in Switzerland, you can see the Earth from COBE (while keeping your feet on the ground). Note that the terminator (the imaginary line separating the sunlit side of Earth from the dark, or night, side) is in view (zoom out to see this more clearly). This is because, by design, COBE was placed in a "Sun-synchronous" orbit, as illustrated here. By pointing the COBE instruments directly away from the Earth and using a protective "Sun-Earth shield," neither sunlight nor light reflected from or emitted by the Earth enters the instruments, giving them the best possible view (from Earth orbit) of the remnant heat from the Big Bang. The following documents are listed in order of increasing technical content, ranging from a popular account of cosmology to a full-fledged tutorial. Educational Resources available from Goddard Space Flight Center's Sciences and Exploration Directorate. Amazing Space - a set of web-based activities primarily designed for classroom use, but made available for all to enjoy. About Temperature a tutorial by Beverly Lynds.